4	4	Heaven Is So Real! Heaven Is So Real! by Choo Thomas was published by Charisma House in April 2006 and is our 14034th best seller. The ISBN for Heaven Is So Real! is 9781591857891. Buy Together Offer for Heaven Is So Real! Reviews of Heaven Is So Real! This book is absolutely brilliant, it cant be faulted, its from the Lord's own mouth. It will change lives if read, believed and applied, a true call to God's sheep both lost and found. Spread the word and it will bring change like no self help book can. Its both challenging and beautiful, God's beckoning call. God is Greatly To Be Praise!! 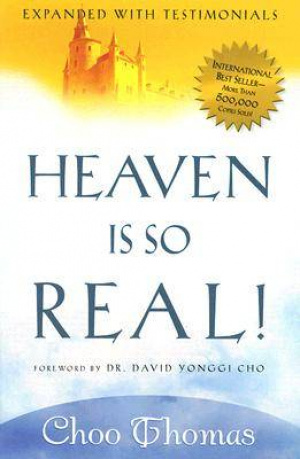 I have read the book Heaven Is So Real several times now and there is no doubt in my mind that Choo went to heaven! I have compared what she saw and what The Lord Jesus told her with what is written in The Holy Bible and I was so amazed by the similarities between the two. Therefore child of God stop doubting and start believing. Therefore let us all take the encouragement and get ready for The Lord for surely He will soon return. Dear child of God, stop doubting and do not allow skeptics to discourage you because we know that there will always be the doubting Thomases but you child of God do not join them. After all there isn`t much difference between Heaven Is So Real and Revelations except maybe details.Hallelujah! God bless you Choo for being so obedient.Allow the Lord to show you more and more and never be discouraged. We are praying for you. I couldn't understand what the great ministry was which Choo was being prepared for. All she seemed to do was write a book which was an addition to the bible. Also to do miracle dancing where she was not in control of her movements. Her encounters with Jesus sounded like she was having a romantic relationship with him. We are told to test the spirits and this one did not ring true to me. Got a question? No problem! Just click here to ask us about Heaven Is So Real!. Details for Heaven Is So Real!